. . . I listen to the new sound of 13Q . . .
Jim Cooper, at that time with WMAK in Nashville, narrates this profile from Programmer's Digest, Volume 1, Issue 16, dated June 4, 1973. 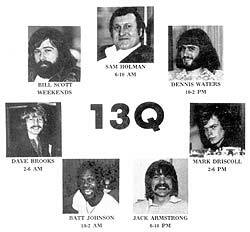 Buzz Bennett was driving the new sound of 13Q, and this composite was constructed while the station was still WJAS, prior to changing call letters to WKPQ in the Spring of 1973. Featured: Former WABC Program Director Sam Holman in morning drive, followed by Dennis Waters (Midday) and Mark Driscoll (PM Drive.) Jack Armstrong (heard here giving away $5000) and Batt Johnson worked evenings, and Dave Brooks handled 2-6AM. Bill Scott did weekends during this period but is not featured in this profile.